University Chancellor Bruce Heilman can’t sit still. 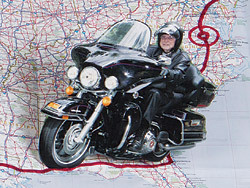 Last issue, we reported on his 9,000-mile journey atop his Harley-Davidson around the lower 48 states. Now he’s back and eager to talk about his greatest hits from the road. Portland, Ore., and Milwaukee, Wis.
Heilman received many warm welcomes. Among the highlights were lunch in Portland with Beth Jordan, B’74, and dinner in Milwaukee with Betsy and Terry Royals, W’79 and R’80, who met as cheerleaders at the old football stadium and were surprised to get a call from the man who signed their diplomas. Executives from Harley-Davidson in Milkwaukee also hosted Heilman for a dinner, and one of the Davidsons guided him through their museum. Interstate 10 across the southern U.S.
“Traveling through Louisiana I was amazed that highway I-10 was built on stilts like adult tinker toys,” Heilman wrote in his travel log. After miles of bridge over swampland, he spent his longest days covering the expanse of Texas prairies. Heilman’s favorite acquisitions were the brochures at state welcome centers. The reading got Heilman reflecting on borders and regions. Spotting the familiar golden arches off so many interstate exits made him feel like he never left home. And sometimes a banana split from Dairy Queen was just what he needed to refresh after a long haul. Lawyer J.C. Boggs, R’84, made waves by swimming in all 50 states before turning 50 on Aug. 3. He squeezed many states into business trips that took him around the country and earned him the lawyer of the year award from the Republican National Lawyers Association. 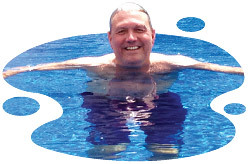 He had one rule: each swim had to be with a competitive master’s team. That meant at least an hour-long workout, open-water swim, or competition. Boggs has swum for as long as he can remember. He was competing by age 8 and swam for Coach Norris Eastman while at Richmond. Like Bruce Heilman, he already is thinking about his next goal, which might be swimming 60 countries by age 60. A few years ago, Grant Garcia, ’06 and GB’09, was a graduate student pairing undergraduates with mentors when he realized how much he could benefit from a mentor himself. His goal was to work in sales and trading in New York, and he needed advice. That’s where Joe O’Brien, R’89, came in. Not only is he head of equity sales and trading at BB&T Capital Markets here in Richmond, but he had worked in New York and taken many Robins School of Business students under his wing. 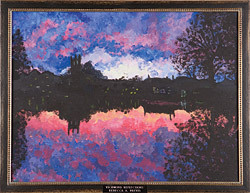 Becca Previs, ’05, painted this twilight landscape of the Westhampton Lake as a student to de-stress after the grind of papers and lab work. Now she’s finishing her medical residency at Duke and will start a fellowship in gynecologic oncology in Houston. She insists she’s no artist, but we’ll let her work speak for itself. What’s new with you? Email your news to classconnections @richmond.edu. A few days each week, Garcia drove downtown, sometimes before dawn, to sit at O’Brien’s desk learning the markets, a relationship they continued for almost two years, with Garcia attending team meetings, contributing research, and getting interviewing advice. Now in sales and trading at Credit-Suisse in New York, Garcia follows O’Brien’s example. He’s banded together with seven alumni at his firm to mentor more Richmond students. For more information about the mentoring program, go to robins.richmond.edu/careers/mentor.html. Annual Giving kicked off its “100 for 1 Challenge” in November, helping ensure that each Richmond student can spend at least one summer pursuing an internship, faculty-guided research project, or international experience while at Richmond. Research shows that these opportunities are a major determinant in student success after graduation. To help, go to richmond.edu/challenge with our heartfelt thanks. 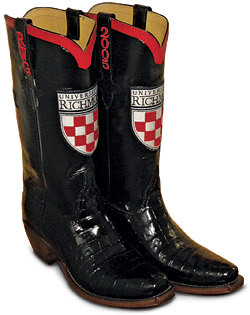 Nancy Sinatra likely would approve of the boots that arrived on the doorstep of Richard Gouldin III, ’05, from the Lucchese Boot Co. in El Paso, Texas. Gouldin put months of planning into the custom-made crocodile and kangaroo leather kicks. That effort spurred a conversation around our office about what other custom gear might be out there. Let us know how you show your Spider pride at magazine@richmond.edu. Photos welcome. Walter S. Griggs Jr., R’63, L’66, G’71, The Collapse of Richmond’s Church Hill Tunnel. Forty years ago as a student at Richmond, Griggs began research for his thesis on a largely forgotten train tunnel that connected the Port of Richmond with the railways. It collapsed with disastrous timing Oct. 25, 1925, killing four and entombing one locomotive. June Pair Kilpatrick, W’53, Wasps in the Bedroom, Butter in the Well. Kilpatrick recalls her childhood in Hopewell, Va., and the ways her family survived and endured during the Great Depression. William Roberson, R’53, Spiritual Thoughts for the Secret Freethinker. “The certainty associated with all belief systems is the foe of personal expansion,” Roberson writes as he explores his journey from a strict Southern Baptist upbringing to a less dogmatic understanding of faith. Mark Souther, G’96, American Tourism. What makes Pedro and his South of the Border tourist trap an enduring, though eccentric, destination? Souther asks questions like that about dozens of popular destinations from Williamsburg to Las Vegas, revealing the creative ideas and marketing behind some of America’s best-known tourist spots. Lost and running late at the 2012 Olympics? Then Bob Ravelli, B’78, was your man. He volunteered as a gamesmaker during the games in London, managing loading and unloading zones for athletes, media, celebrities, and other VIPs. The role fit well with Ravelli’s background as an urban planner specializing in transportation planning. He also answered questions and gave directions to countless spectators at Horse Guards Parade, which hosted the beach volleyball competition. A location near 10 Downing Street also assured a steady traffic of government ministers (plus one of the Downing Street cats), but his most memorable interaction came from two ordinary but frantic ladies who were flustered enough to overlook one minor, important detail. Ravelli saw that their tickets were for the indoor volleyball competition—a few miles away. Ever courteous, he helped them hail a cab and saw the slightly embarrassed duo off.